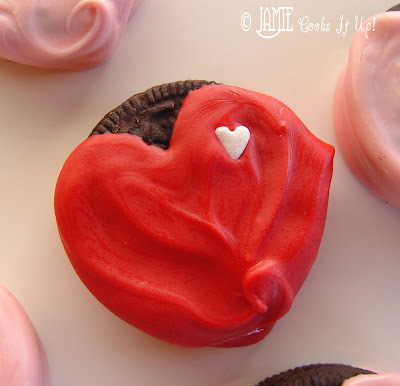 These Sweet Heart Oreos would be perfect for your sweet heart. They don’t take a lot of time, baking is not even required! it seems we have heart shaped cookies! There could be any number of reasons! “MOM! Those are absolutely darling! She was in a thoughtful, kind mood. “I had a dream about them.” I admitted. “Ain’t it the truth, honey. Ain’t it the truth.” I had to agree. And fun! I can not deny it. Hope you have some fun making them! These are candy wafers. I found them at Hobby Lobby. They have all kinds of fun colors there…if you want to make say… yellow or blue heart shapes just go ahead and do so. Way to think outside the box. I bet you have been dreaming about yellow and blue heart shaped oreos, haven’t you! Don’t worry, I won’t tell anyone. Especially FashionAnna! She might tease you, and I wouldn’t want your self esteem to be teetering or anything. Here you have some heart shaped sprinkles. I found these lucky treasures at Wal Mart in the seasonal section. 1. Put one color of your wafers in a microwave safe dish. Glass measuring cups work really well. You want something that is somewhat deep. Melt the candy wafers in the microwave for 30 seconds. Stir, and return to the microwave. Heat them in 30 second increments, stirring after each interval until they are all nicely melted and you have a smooth dipping substance. Please don’t be tempted to heat them quickly….you won’t be happy with the result. 2. Hold on to the top of an Oreo. Dip one side in…. 3. Tilt the Oreo ever so slightly and dip the other side. Be sure to leave room for your finger at the top. You are building a heart here, and you want to be sure you leave space for the round tops of the heart. 4. Lay your Oreo on a cookie sheet LINED WITH WAX PAPER. 5. Take a butter knife and scoop up a small amount of the red candy coating onto the end of it. 6. Smooth the candy coating from your knife up on the tops of your heart. Spread the candy coating around and into a heart shape. Push some of the candy coating down to the bottom and off the edge of your Oreo. Then lift your knife up at the bottom tip of your heart. This will make the a little swirly pattern. Cute. Fun and Cute. Now just a note here. If you have a hard time making the heart shape…..don’t worry about it! Just try again on the next one. It took me a couple of really ugly looking hearts to get it down. If you don’t get it down, don’t sweat it! Just smear the candy coating all over the top, pour the sprinkles on top and you are good to go! They taste great, heart shape or not. 7. Place the little heart shaped sprinkles in one corner, or all over, or not at all. Up to you! 8. Let the cookies hang out on the wax paper until set. It should take about an hour. This is perfect when you want something cute and sweet without having and entire kitchen sink full of dirty bowls to clean up! And, as much as I love baking, I do love Oreos, yum! What an easy and festive thing to do for V-Day! Love it! What's wrong with dreaming about oreos dipped in chocolate? That sounds a lot better than most of my dreams, which are usually about futility or running away from something. that is such an inventive idea, and pretty easy! 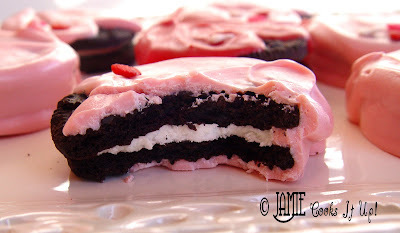 I think I'm going to make some this weekend! Thanks! To cute! Thanks for sharing!! 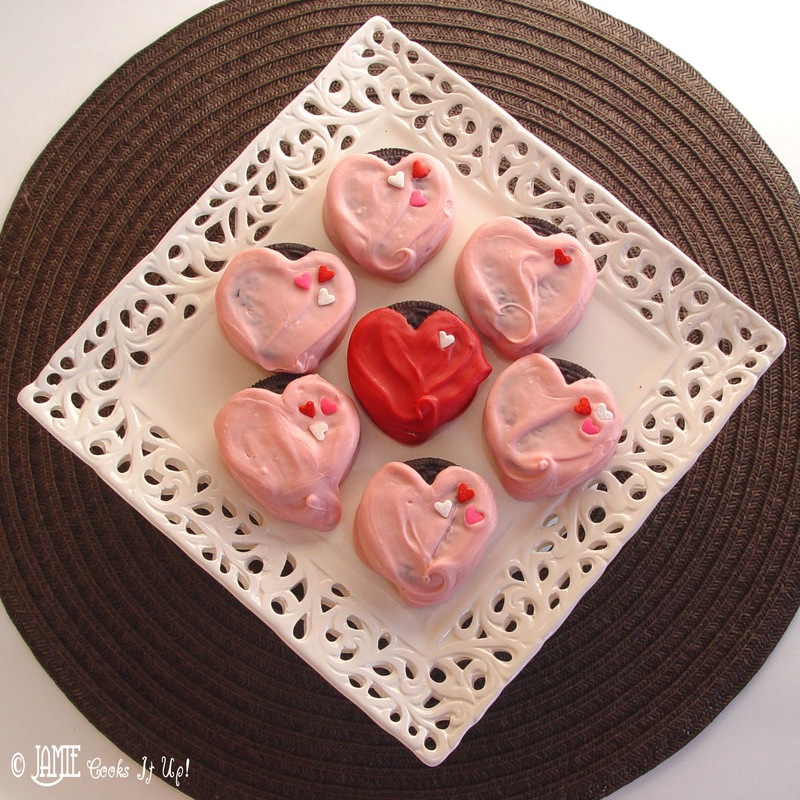 Can never have enough heart ideas for V-day! esp. quick, cute, simple ones! These are really wonderful, and such a great idea! 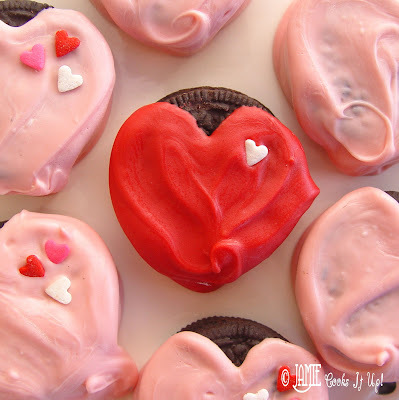 I never have time to do a lot of Valentine Treats, but I am going to do this one!